Sometimes in a busy working day we hardly get anytime to prepare something to impress our beloved.Couple of days back i received a jar of a freshly blended coffee powder from “The Malnad Times”. Believe me when i tried my first cup of cappuccino ,the taste was exquisite.Smooth and perfect !! 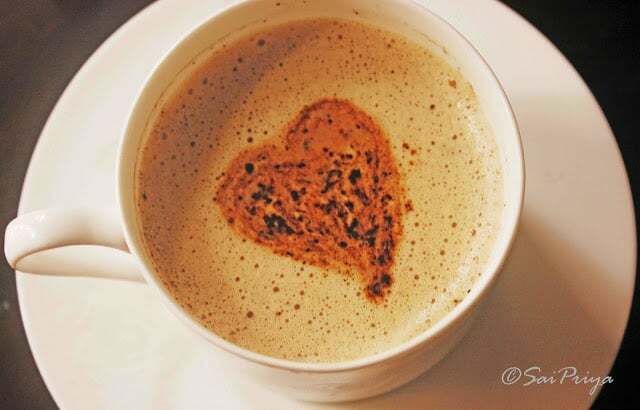 Here i am sharing recipe of a cappuccino which can be made in 10 minutes. Take coffee powder and sugar in your favorite coffee mug and mix well using a spoon with 2-3 drops of water. The more you mix the more foamy will be your coffee. Boil the milk up to boiling point and blend it using a hand blender for 5-6 minutes until you notice some foam created on the top. Now pour this mixture little by little into your mug.You can create some design when you finish with the last few drops of your foamy milk. I rather sprinkle some powder on the top and used a tooth-pick to create a heart-shape floating on the top to impress my hubby !! Make powder of your regular sugar as it mixes easily. You can add some cinnamon or green-cardamom powder to your milk if you want.